May 7, 2018 – Our time machine travels back to meet rival Cherokee chiefs in the decades leading up to and through the American Civil War, when the supporters of John Ross and The Ridge engaged in a blood feud that led to war, the infamous Trail of Tears, and the devastation of a once-proud nation encompassing what today is several southern states. 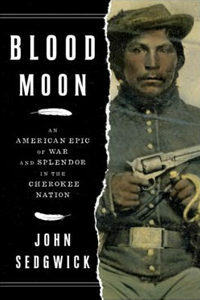 Our guide on this journey is John Sedgwick who brings us Blood Moon: An American Epic of War and Splendor in the Cherokee Nation . John Sedgwick is the bestselling author of thirteen books, including War of Two — his acclaimed account of the Alexander Hamilton-Aaron Burr duel — two novels, and the family memoir In My Blood . You’ve seen his work in GQ, Newsweek, Vanity Fair, and The Atlantic. You can find him online at JohnSedgwick.biz.